Holiday Apartment at the "Costa Dorada"
Roda de Barà is a village in Catalunya on the east coast of Spain: the Costa Dorada. 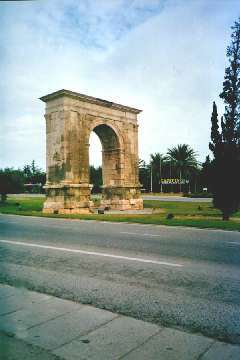 It is about 70 km to the south of Barcelona and about 14 km to the north of Tarragona. The climate in that area is temperated. There isn’t often heavy rainfall, especially in summer, and you have warm, but not too hot summers and mild winters. Even in high season neither the village nor the beach are overcrowded and the beach and the sea are clean. You can find out the exact weather here. You can plan your journey with ReisePlanung.de. The apartment is suitable for a couple with one or two children. It consists of a double-bedroom, a living-room with sleeping accomodation for the children, a kitchenette, a little bathroom with shower and a terrace with sea view. Furthermore it is equipped with heating and sattelite TV. The distance from the apartment to the beach is about 3 km. A public swimming-pool and a tennis court are nearby ( 300 m). On the premises of the house there are one dog and two cats, so the apartment is not suitable for people who don’t like animals. In the nearby (2km) Roc San Cayetano, for example, one see nearly every style of Spanish architecture. It is situated on the coast and has a sandy beach, several bars and restaurants and a nearly finished new sports-harbour. 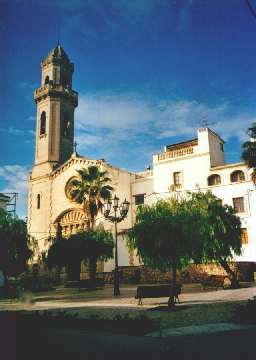 Only about 100 m from Roc San Cayetano one can visit a lovely chappel: the "Ermita”. From there you have a wonderful view along the coast. One can go on long walks on the beach and should one need a rest, there are several beach-bars. Moreover there is the “Aqua Leon”- a water and animal park nearby (about 20km) -, and the adventure theme park “Port Aventura” is only about 30 km from Roda de Barà. The popular resorts Salou, Cambrils and Sitges are also near. If one takes the motorway in direction of Barcelona it is about 60 km to the monastery of Montserrat. Furthermore one has the Unesco protected Roman city of Tarragona (14 km) and the 1992 olympic city of Barcelona (70 km) with all their sights, monuments, churches, museums etc., nearby.